Our older two kids learn more and more about recycling, living green, our environment and global warming everyday. We recycle what we can and do what we can to live greener. I was given a great opportunity to work with Little Green Books, an eco-friendly series for children from Simon and Schuster. 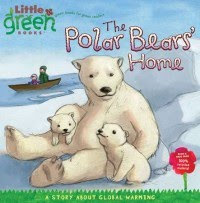 Little Green Books are great for kids learing all about recycling, global warming and all about our environment. I was thrilled to have this opportunity and my kids love the books we were sent! In “I Can Save The Earth!”, you will meet Max, a little monster that liked to make messes, throw candy wrappers everywhere, overflows the bathroom sink or clogs the toilet because he thought his toilet was hungry, leave lights turned on even if he wasn’t in the same room, etc. One night when the lights go out, he sees how beautiful our planet is when he looks out the window. Max transformed his life and started living greener because he realized the pollution can hurt the planet and animals and he wanted to keep our planet a beautiful place. 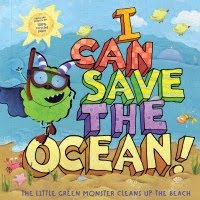 In “I Can Save The Ocean!”, you get to see Max the little monster on the beach. He left a mess on the beach and when he went into the water, he noticed a few things from the beach had come into the water. Since it made the water look ugly, he cleaned up everything including other beachgoers’ trash and placed it in recycling bins. He realized that the litter at home can still pollute the ocean. He learns about things that he can do that can protect the ocean even from home, like keeping litter away from gutters that lead to the ocean, using reusable bags instead of plastic, using reusable bottles and biodegradable sunscreen. I think these books are really great for our “little green readers”. These books show our kids what is wrong for our environment and why and how we should take care of it. The story also demonstrates what these actions can do to help our planet and our ocean. I think this is wonderful for kids so that actually know why we do these things and how the things we do helps. They are also fun to read too and they also open a line of discussion with our kids to talk about the stories to learn even more! 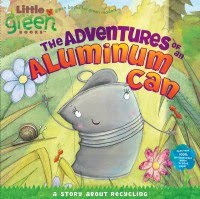 These two are great books for our “little green readers” to read and learn about what actually happens to plastic bottles and aluminum cans when we recycle them. Both “The Adventures of a Plastic Bottle” and “The Adventures of an Aluminum Can” have the same format to them. They are both like a diary for the bottle and the can and they tell their story through their diary from day one before they even become a bottle or a can. They tell about how they become a can or a bottle, how they were made, what they were used for before they were recycled and what happned to them during the recycling process. They even tell you what they were made into! These books were great for my kids since they ask a lot of questions. It teaches kids about what happens to recyclable items and how they are made into something else. I also love how it tells the story from the beginning to the end. My kids love it and think it’s exciting that a bottle and a can pretty much comes from nothing to begin with before they become a bottle or a can. They love it that they can go on to become something else after they are recycled. 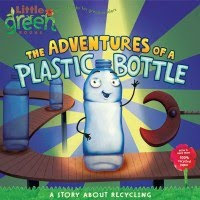 I think these books are a great way to get kids wanting to recycle because they see the character in the book actually living a life and continuing it on and on again! I also think my kids learning about how important global warming is, is just as important as recycling and living greener because they go hand in hand. “The Polar Bear’s Home” is about a little girl that lives in the arctic. She went for a boat ride with her father and saw baby polar bears all alone. Her father explained to her that their mother must have left them alone so they can watch her hunt but the ice broke away. He was telling her all about how the polar bears live, how they eat, and how the ice melting was making it harder for them to hunt for food. He explains that what we do to the planet causes global warming and if we don’t do things to help, eventually there won’t be any more polar bears. There are even examples in the book about what we can do to help. 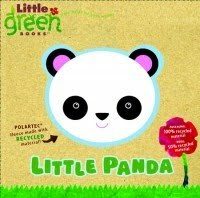 “Little Panda” is a book for our youngest little green ones. It’s a book for babies made from recycled fleece. It’s a cloth book about a panda bear and each cloth page you can read what panda likes to eat, and what he likes to do. The pictures are also really cute. This book is also machine washable! All Little Green Books also have a glossary at the end of them for those words like compostable, etc. that kids may not really understand. The glossary makes it easy for them to learn what these words are and what they mean. Not only are Little Green Books about recycling, our environment, global warming, etc., they are also made from 100% recycled materials and are 100% recyclable. They are even printed with vegetable or soy inks. 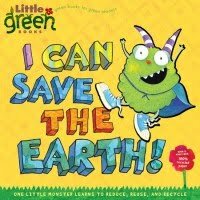 Little Green Books and Simon & Schuster Children’s Publishing also partners with Evo.com, Eco-Libris, Keep America Beautiful, Trees for the Future, and The Daily Green. To read more about these great organizations, see Little Green Books Partners page. Not only do I think that Little Green Books are great for kids learning about our environment, their website also has games they can play, activities and coloring pages parents and teachers can download and you can read their blog. Check out Little Green Blog and read about monthly green tips, ideas from kids and so much more! I love how they are compassionate about our planet and have a fun way to bring learning about our environment to our kids! Even though Earth Day is over, there are still green movements that goes on throughout the country. Everyday should be a day to celebrate and take care of our planet! Buy It: Visit Little Green Books to find out where to buy your books today! Little Green Books and The Big Green Help have also teamed up to bring your child green books featuring their favorite Nickelodeon characters! Win It! Little Green Books is generously offering my readers a chance to win all six of these amazing books! One of my lucky readers will win! Giveaway is open to US. Giveaway will end June 30 @ 11:59 PM (EST). Winner will be chosen using random.org. Winner will have 48 hours to respond after I contact via email. If winner does not respond, a new winner will be chosen. Good Luck! what we do to be green – a LOT!!! recycle everything we can, use tote bags for groceries, use compact fluorescents, ride public transportation, and buy organic whenever possible. for starters! Love the What Do You See? I love this one – which we already have: Don't Throw That Away! : A Lift-the-Flap Book about Recycling and Reusing.. now my son loves to pick up trash! I like My First Garden because I'm a big gardening fan. And at our house, we recycle aluminum and plastic bottles even though it means we have to drive it 5 minutes away since our trash services don't offer curbside pickup for recyclables. I played the What Do You See game! Cute illustrations. As for what I do to be greener, I've been cutting down on shower times. It makes a difference in the water bill too! I'm entered in your guidecraft dump truck giveaway! I'm entered in your septoys giveaway! I like the "Adventures of a plastic bottle" and "santa claus is green" books! well if I have to choose one thing we do to live green, we use reusable sandwich bags instead of plastic disposible ones, ones like litter free lunch, snack taxi, food kozy, etc. We'd love the What Do You See? : A Lift-the-Flap Book About Endangered Animals too. I entered th hearthsong giveawy! I like "My First Garden." i like how the little monkey/ little panda books are soft… great for little ones! we are being more green by using reusable sandwich bags! I entered the Finger Foods giveaway! I entered the Big Rig giveaway! I entered the Mommy Pads giveaway! I like "Don't throw that away!" We try to live greener by using green cleaning products (7th generation, nature's source, etc.) I also try not to launder some things unless absolutely necessary, i.e. towels get reused a couple times before going in to the wash. I entered your Guidecraft Big Rigs Dump Truck giveaway. I like "What do you See?". My family recycles, has a veggie garden, and turns off the lights when we're not in the room. Entered the Mommy Pads & More giveaway. Entered the HearthSong Great Big Outdoor Playball giveaway. Entered the Guide Craft Big Rigs Dump Truck giveaway. I visited Little Green Books and think my granddaughter would love "Santa is Green" and "My First Garden." I try to live a little greener by recycling & using Eco-friendly products like Seventh Generation's cleaners ect…We also drive less and walk to the grocery ect..whenever possible. My little guy had fun with the Arctic Maze. I entered the septoys 7 sided blocks giveaway. I entered the 5 childrens' books giveaway.. I went to Little Green Books and I played the recycling game–really cute for younger kids. I like "My First Garden"